Mark, the Bosun for the Elissa, has a strong interest in ham radio. His support was invaluable. We were able to get him on the air on Sunday. Husband and wife tag team, working the pile up. Video from Sunday showing operators at work. 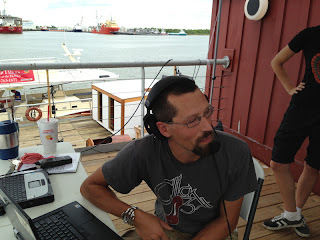 You can hear James making a qso. One of the regular cruise ships. It came in sometime Saturday night. All day Sunday we heard chimes, bells, announcements etc until she left that afternoon. The event was fun. 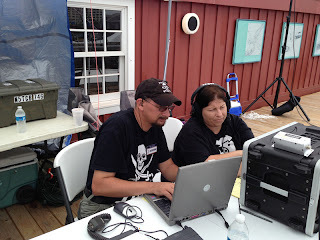 We added at least three stations to the event this year. Last year we had on station on hf and one for a local vhf net. This year we added an additional hf station, we also added a vhf ssb station and a satellite station. I will come back and try and post a summary soon.